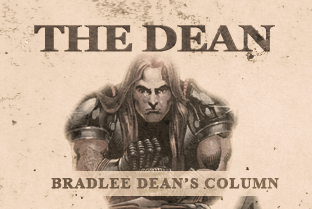 “Bradlee Dean, you stinking sack of vomit, this is just the same old tired, idiotic BULLST!!!! You stupid b#@tard – how dare you accuse our legitimate government of ‘tyranny’? You hypocritical prk! YOU are determined to impose Christian tyranny on this proudly secular, multi-religious country. YOU are like Hitler, Stalin and Mao, not Obama, who is a good, decent, honorable, honest, courageous, compassionate man – EVERYTHING YOU ARE NOT!!! “It’s ILLEGAL to teach evolution in schools??? You blithering idiot!!!! SAYS WHO?????? You f*#king a@#hole! You are determined to teach kids the idiocy of creationism as scientific fact in schools!!!! How dare you demand that our schools indoctrinate kids with BULLS@#T? “You are determined to teach blatant lies about homosexuals and homosexuality to young people, which will turn them into the same vicious homophobic bigot YOU are!!! You are no better than Hitler. But Hitler was at least an intelligent and educated man. YOU are a blithering idiot with s@#t for brains. I am going to organize a campaign to have you permanently barred from ever setting foot in any public school in the U.S. for life, and will see to it that if you ever do so, you will be immediately arrested, prosecuted and given a stiff jail sentence. YOU ARE A F@#KING CRIMINAL. A bigoted, hateful, hypocritical and self-righteous a@#hole!